Cultural traditions are passed on through generations, perpetuating our use of animals for food and pleasure. In upholding religious festivals and food practices, medicinal ‘cures’, and superstitious beliefs, animal abuse continues without question. We can be reluctant to let go of cultural traditions, seeing change as a rejection of our culture, or even an attack on our identity. It seems irrational that we welcome technological progress that changes the nature of cultural traditions, such as machinery, yet we reject the moral progress in re-thinking the tradition entirely. Hunting marine mammals such as dolphins and whales, now known to be intelligent social beings, is an example of this self-serving thinking. The annual dolphin hunt in the Japanese town of Taiji is defended on the basis of tradition and culture, and justified on the basis that dolphins aren’t endangered. Yet mercury-laden dolphin meat is becoming less popular to the extent that this ‘traditional’ meat trade would no longer be viable without the substantial profits from selling bottlenose dolphins to marine parks and aquariums. Dolphins aren’t just kept in captivity in well-known facilities such as SeaWorld, but in smaller aquariums and hotel swimming pools which are even less humane. Swim-with-dolphin experiences come at a high cost to dolphins. The Japanese government is resistant to suggestions of change, seeing the criticism of Taiji as a cultural attack rather than a desire to end animal cruelty. Likewise, tradition is the justification for the brutal Faroe Islands’ pilot whale drive where entire pods, including mothers and calves, are driven ashore and butchered with hooks and knives. Known as the grindadráp, or “grind”, the whale hunt is a centuries old cultural tradition. Whale meat and blubber once provided an important food source for the Faroese people, and whale oil was used for cooking and export. Islanders claim this whale massacre is ‘a natural way of life’, but the islands now have a thriving fishing industry with exports to the U.S and Europe. The Faroese are no longer an isolated community of hunters surviving in harsh conditions like their ancestors. They enjoy an improved standard of living in a growing economy. As well as causing suffering to pilot whales, there’s human suffering too with the health problems associated with high levels of mercury found in whale meat. If the Faroe Islands is a “modern society closely in touch with its unique natural environment,” (Whaling.fo) then the government might reconsider its modern day treatment of pilot whales, which seems to be more in touch with the past than with the unique environment it has the power to protect. Religious festivals are also cultural traditions that can involve incomprehensible cruelty to animals. The Hindu Gadhimai festival held in southern Nepal every five years has attracted global outrage at the slaughter of hundreds of thousands of animals. During the 2009 Gadhimai festival, an estimated 500,000 buffalo, goats, chickens and other animals were decapitated. The centuries-old ritual is considered to be the largest animal sacrifice in the world. It is believed that animal sacrifices to Gadhimai, goddess of power, will bring good fortune, health and happiness. Some animal sacrifice defenders see the campaign against the festival bloodshed as the persecution of Hindus. They argue that the animals would die and be eaten anyway. Holding slaughterhouses up for scrutiny, they ask what the difference is between an animal killed at the festival and one killed in a slaughterhouse. Western consumers of factory farmed meat want to believe they aren’t involved in animal cruelty. But they don’t watch what goes on behind closed doors in slaughterhouses when rules and standards are breached. Agriculture has become so industrialised in Western culture that animals are treated as inanimate products on a production line where speed and profit are the priority. Western countries must examine their own attitude to animals, especially with regard to intensive farms and slaughterhouses. They make a distinct separation between animals traditionally kept as pets and those used for food, treating pets with care and farm animals with indifference. Wild birds have long been victims of hunting, whether for sport or food, but with increasing human populations, birds are being exploited on an unprecedented scale. Birdlife International report that over twenty-five million migratory birds, including chaffinches, thrush, robins and quail, are being illegally killed each year in the Mediterranean. The worst offenders are Italy, Egypt, France, Syria, Libya, and Cyprus. Birds are hunted using barbaric methods including trapping, poisoning and smearing branches with glue. Mist nets can reach seven feet in height, forming an invisible barrier along stretches of coast, such is the industrial scale of the slaughter. In Malta, the spring shoot targets migratory European turtle doves on their way back to breeding grounds, severely impacting population recovery of this much-loved and endangered bird. Where laws are in place to protect songbirds, governments and authorities in some countries are turning a blind eye. Those in power may be hunters themselves, or know hunters, so widespread is the practice. In Australia, endangered migratory ducks are caught in the crossfire of mindless duck shooters who don’t properly identify their target, and in Scotland, endangered birds of prey are mysteriously being poisoned or shot as estate managers maintain grouse numbers for hunting. Rodeo events are still popular in cattle ranching countries such as Spain, Mexico, the U.S, Canada, Australia and New Zealand. Cowboys attempt to bring bucking horses under control, or rope young calves and drag them to the ground. At the Torneo de Lazo rodeo in Mexico, bulls are encouraged to gouge horses who die in agony with entrails spilling forth as riders remain unharmed, and in Spain, bullfighting is still holding on despite opposition from the younger generation. The government has even talked of opening a bullfighting academy so the ‘art’ doesn’t die out, such is the refusal to let go. In the UK, the fox hunting brigade are calling for restrictions on hunting with packs of hounds to be lifted, which would see a return to foxes, sometimes pregnant vixen, being ripped apart. Fox hunters might look to orienteering on horseback for a re-incarnation that would preserve the social, riding, and trail elements of their sport, unless it’s bloodlust that drives them. In China, North Korea, Laos, Vietnam, and Myanmar, Asiatic black bears and sun bears are kept in cramped cages and farmed for bile. China is the biggest market for elephant tusks and rhino horn, as well as the helmeted hornbill’s beak. The South-East Asian hornbill is a critically endangered species. Traded by organised criminal groups but more expensive than ‘white ivory’, this avian ‘red ivory’ is likewise used for carving ostentatious ornaments, as well as for Chinese medicine. As with elephants and rhinos, there is scant regard for the helmeted hornbill’s survival crisis. Big consumers of shark fin soup, Chinese appetite drives the cruel practice of cutting fins off live sharks that are thrown back into the ocean. Unable to swim, the shark sinks to the bottom and suffocates or is eaten. Shark fins are also believed to have medicinal benefits, although there is no scientific evidence. Then there’s the annual dog meat festival. Dogs, both strays and stolen pets, are rounded up across China and transported in cruel conditions to Yulin. Dogs are bludgeoned and some are scalded and skinned while still alive. The Humane Society International report that the general public in China oppose the event, but authorities have yet to take action. 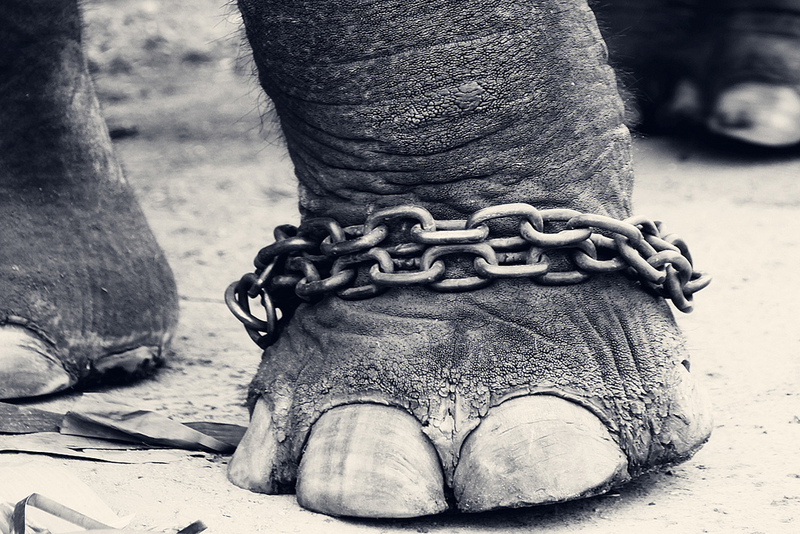 The fortune of animals kept in captivity for entertainment varies widely. There are zoos that provide enrichment programs and create a more natural habitat. They help to fund global conservation programs and scientific research, and can also provide a safe haven for critically endangered species. But there are also captive facilities where conditions cause great suffering and premature death, especially in countries with inadequate animal welfare laws and prosecution. Some species aren’t suitable for captivity, for example, animals that live in social groups or travel long distances in their natural habitat. Asian elephant Hanako spent 61 years in captivity in appalling conditions in a Tokyo zoo. Campaigners urged the zoo to look at improvements to her living conditions and care, but this lonely elephant died this year never having seen another elephant during her incarceration. SeaWorld has been heavily criticised for keeping cetaceans in tanks, their plight highlighted in the 2013 documentary Blackfish that tells the tragic story of orca Tilikum. The Whale Sanctuary Project has been launched by animal welfare advocates and marine mammal scientists to create an ocean sanctuary where captive cetaceans can be released without the risks of total ocean freedom. Sadly, Tilikum is now so sick that he will never see the ocean again and will end his days in a SeaWorld tank. In Taiji, albino dolphin ‘Angel’ is a prisoner in the local authority whale museum, a stone’s throw from the ocean where she was taken. In Beijing aquarium, dolphins are ridden like surfboards and applauded by people who may never experience the incredible sight of wild dolphins leaping from the ocean. Elephants used in circus performances lead a lonely life, separated from mother and herd at a young age and never living in a natural environment. These powerful, long-living mammals have their spirit broken so they are obedient and more easily trained. They suffer injuries as they balance unnaturally on small boxes or each other. Now we know more about animal behaviour and intelligence, we can no longer justify confining wild animals in conditions that deprive them of natural behaviour and habitat. Animals aren’t just kept in institutional captivity for our entertainment, but are also captive in our homes. Although we give more attention and care to the needs of our pets, there are many considerations for their welfare. It isn’t enough to provide rabbits with a hutch and carrots, or birds with a cage and seed. As well as providing shelter and sustenance, we need to understand our pet’s behavioural needs. Whether for sport, entertainment, religious sacrifices, or food preferences, people are prepared to defend their culture against criticism, rather than question the ethics. But as we learn more about our environment and its animals, cultural traditions based on outdated circumstances can be revised. Progress isn’t just about improved technology, engineering, or medicine, it’s about moral progress that recognises animals as sentient beings worthy of our respect and consideration. As Mahatma Gandhi said, “Be the change that you wish to see in the world”. Keen to help? These organisations would welcome your support, whether a donation, social media promotion, or volunteering.